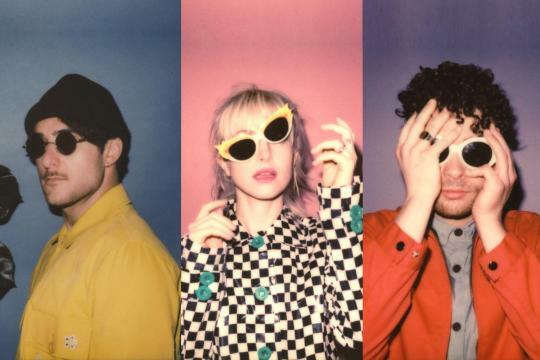 Paramore recently made a powerful comeback with their new album “After Laughter”, which dropped May 12th. I was stoked to hear the first single off the album ,“Hard Times”, which draws a lot from indie-pop with classic punk undertones – which isn’t surprising from the band who brought us “Misery Business”. Immediately, I feel in love with the aesthetic of the album; it’s filled with pastels and playfully muted colors. The album exemplifies something that the band was really playing with and moving towards in their self titled album. The color and tone of the whole album feels a bit reminiscent of some of their previous songs like “Fast in My Car” or “Ain’t it Fun”. In fact, the lead singer and front-woman, Hayley Williams, wanted to take the band in such a new direction that there was an entire shift in the membership. The bassist, Jeremy Davis, left the band and pressed into a legal battle with Paramore, and Zac Farro rejoined the band as the drummer. Current membership stands at Hayley, Taylor York, and Zac Farro. Needless to say, the direction Paramore had taken with After Laughter is certainly enjoyable both visually and in it’s sonic texture. You can check out the music video for “Hard Times” here, to get a feel for the aesthetic of the album. (Not to mention, Hayley Williams absolutely murders with those platinum locks). You think I’ll look alright with these mascara tears?/See I’m gonna draw my lipstick wider than my mouth/And if the lights are low they’ll never see me frown”. Damn, are you okay Hayley Williams? Then again, we’ve also got tracks like “26″, “Caught in the Middle”, or “Forgiveness” which are unapologetic (pun NOT intended) in their tragic nature. I mean, come on, with lyrics like “I don’t need no help, I can sabotage me by myself” these tracks are practically begging you to let a tear loose. (not that I cried, or anything) They do well to round of the album so we aren’t just being constantly slammed by the pop-punk feel that Paramore does so well. Most of the tracks are tied together by a playful sonic undertone that I can only describe as “pastel”. It’s the beat of a tambourine or the tapping of a xylophone that lends so strongly to the album’s entire texture. Moreover, I love Hayley’s vocals on this album, with the quick changes in key and tone, it’s really riveting to listen to, and the guitar complements it so well. Personally, I’ve always viewed Paramore as one of those hard-to-reach punk, “emo”, bands that didn’t really appeal too strongly to me. But with this album I really feel like I’m seeing the band, especially Hayley Williams, in a whole new way. They haven’t departed from their core sound, but they’ve certainly evolved and time has been kind to them. I’m excited to see what direction this album takes them in. In sound, aesthetic, and lyrical content – this album is the real deal. It’s a really strong album musically, and reveals tender spots in it’s lyrics. There’s a lot to be explored here, and you can be sure I’ll have this one playing on repeat for a long time.